(CCTV via cat898.com) CCTV's <News 1+1> program. Host: We just watched a video clip taken on a mobile phone on November 13 in the Jinniu district of Chengdu city where a demolition was taking place. A spectator took the video and provided it to this program. The woman standing on the rooftop chose to take a very extreme action in order to stop the demolition. Today, the relevant department in Chengdu provided more concrete information to the media, including the fact that the woman died two days ago. In this short video, we can hear from the noisy background that many people were still trying to dissuade her: "Don't do this! Come down! We can talk about this calmly!" Professor Wang, what are your feelings after watching this video? Commentator Wang Xixin: A vibrant life was lost via such an extreme, tragic manner. We remember her name -- Tang Fuzhen. No matter who was right or wrong, this is still a tragedy. As people who are still alive, we must ask just why this tragedy occurred. We can even ask just what factors are working behind this tragedy. If we do not reflect on these types of tragedies, it may recur. Host: What is more important than life itself? Why did Tang Fuzhen chose such an extreme method? Let us watch this short documentary to see the details of this case. "During the process of law enforcement, there was the accidental self-immolation of Tang Fuzhen. This outcome was something that nobody wants to see. I am deeply pained." This morning, Chengdu city Jinniu district urban management law enforcement bureau director Zhong Changlin told the media while explaining this incident. Tang Fuzhen was a 47-year-old woman in Jianhua community, Tianhui town, Jinniu district. About twenty days ago, she poured gasoline on herself and set fire during a demolition dispute. The video taken by mobile phone was what happened twenty days ago. Tang Fuzhen stood on the rooftop. According to Jinniu District urban management law enforcement bureau director Zhong Changlin, he took his personnel to the address to demolish the illegal building belonging to the family of Tang Fuzhen. But Tang Fuzhen was completely oblivious to the orders and persuasions from the law enforcement personnel. She threw bricks, rocks, gasoline bottles at the law enforcement officers and she tossed gasoline firebombs at them. The stalemate lasted almost three hours until Tang Fuzhen poured gasoline on herself. This three-story building was the former home of Tang Fuzhen. According to Jinniu District urban management law enforcement bureau director Zhong Changlin, this was an illegal building that was constructed in 1996. At the time, the private entrepreneur Hu Changming (the husband of Tang Fuzhen) paid 40,000 yuan in crop compensation and 10,000 yuan in rent to sign an agreement with the Tianhui town Jinhua community to build the house. But no land planning permit and plan usage approval had ever been issued. This illegal building is a brick-concrete house of about 1,600 square meters in area that is used for business purposes. In August 2007, a waste water management project in Chengdu city included this house within its area of operation. After two years of work (including the decision to demolish within a fixed time limit, administrative reviews, etc), no agreement was reached. On April 10 this year, the Jinniu district urban management law enforcement bureau attempted to conduct a demolition. But Hu Changming, Tang Fuzhen and other relatives threw petrol bombs at the law enforcement officers and poured gasoline on them. That first demolition attempt was foiled. On November 13, the Jinniu District law enforcement bureau went again to demolish the building. Tang Fuzhen poured gasoline on herself. Ten minutes later, a tragedy occurred when she lit the gasoline. Host: Professor Wang, the video let us realize that nobody wanted to see this tragedy. I am deeply pained by her death. But the Jinniu District urban management law enforcement bureau director Zhong Changlin characterized the outcome as an "accident." An accident is something that nobody expects so that there was nothing anyone can do about it. But we can see from the video that there were several minutes between the time that she poured gasoline on herself and the time when she set off the fire. What could people have done during those ten minutes to prevent the accident? Wang: I think that many things could have been done. So what is an accident? As you said, an accident is something unforeseen and therefore uncontrollable. We call these accidents. 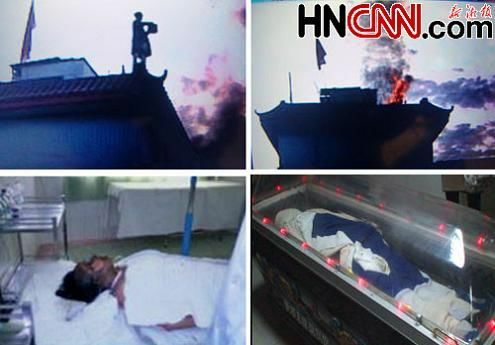 But the video showed that Tang Fuzhen had taken a very extreme action which is highly indicative of something to come. Couldn't the law enforcement officers foresee it? Clearly, they can foresee it. Host: But even in the noisy background of the video, we can still clearly hear people saying, "You come on down. We can discuss nicely." She did not listen to that advice. Wang: When the law enforcement officers asked her to come down, they still wanted to stop her. We can say there that they wanted to do this on one hand but they were also continuing with the demolition on the other hand. Under these extreme conditions, shouldn't they consider stopping the demolition and then express the good will to want to discuss? This is what I said before. This should have been anticipated. On the other hand, as you just said, there was a ten minute gap between pouring the gasoline and setting off the fire. Many things could have been done during those ten minutes. For example, the firefighters at the scene could have used the ten minutes to spread foam on the body of Tang Fuzhen. The fire would not have gone off so easily. Therefore, this may seem to be an accident, but this accident was not unexpected. Host: This was a special scene that took place at a demolition site. When the principal poured gasoline on herself, the firefighters did not use foam immediately. When she actually set herself on fire, the firefighters took action. If we think about it, will the armed police and the firefighters take action in time if this had occurred at a normal home instead of a demolition target? Wang: I think that this is not just about a normal scene. When a certain danger exists, it is better to take some preventative measures beforehand rather than afterwards. Host: Why is it that different responses occur at an ordinary residence than in a demolition scene? Wang: I think that the main reason is that at the scene of a demolition, the law enforcement officers and the property owners who claim to use their lives to defend the property are in an antagonistic relationship. Both sides may think that the other side will make some concession. But the tragedy is precisely here. Under these extreme circumstances, neither side felt the need to make any concession. Host: In the short video, it was mentioned that the Jinniu District had attempted to demolish the house in April this year without result. So this was the second time. There is a problem here. One side wants to demolish in accordance with the law. The other side wants to resist this legal demolition with her life. Such cases will happen again. What should the two sides do when the same thing happens? Wang: Indeed, when the government wants to demolish, they insist that they are acting in accordance with the law. But the homeowners will also emphasize that they are defending their property in accordance with the law. There is a dispute between the two sides. This is the first thing that we see. The second point is that if this dispute is carried out with extreme actions, we must consider the right to life. The life of a citizen should be most important. In the case of this Chengdu incident, the tragedy might have been averted if the action was delayed even if it is in full accordance with the law. The demolition could be carried out later. This is like when we see a criminal taking a hostage. The police may need to consider negotiations with the criminal, because the life of the hostage is considered to be most important. Even if a demolition is in accordance with the law, I will undoubtedly choose a life over it. Host: Can we characterize the action of Tang Fuzhen to pour gasoline on herself as a form of self-kidnapping? She held herself hostage in order to negotiate. Under such circumstances, should we consider the safety of the hostage? Wang: Of course. There is no difference in the nature. Tang Fuzhen is using her life in her so-called resistance. No matter what the facts are and no matter who is right or wrong, we should consider the right to life. Hu Junlin (Guiyang city Yunyan public security bureau director): Twenty suspected criminals including Chen Qirong were arrested for property destruction and four suspected suspects including Lang Huijun were arrested for disrupting traffic. (Voice over) At the November 30 press conference, the Guiyang police reported the news of 24 people being arrested. These 24 people included people from both sides, the demolishers and the demolished. Early morning five days ago, there was this violent incident of forced demolition. Hu Junlin: The real estate developer gathered several dozen unidentified persons who were armed with steel rods, crowbars and duct tape. These people broke into the homes and dragged off 13 innocent citizens onto cars to be dumped in various remote places in town. Four of those citizens were injured. (Voice over) When the police arrived at the scene, 26 buildings were already destroyed by two bulldozers. Some of the residents found knives and stood off against the demolition crew. The demolishers fled the scene, but the residents were still angry. Hu Junlin: After the violent demotion incident, more than 30 people from the demolished buildings ignored the advice of the police and blocked four road intersections with red banners and 40 liquefied gas canisters. They used violent methods to demand explanations. (Voice over): On one side, there were the violent hired hands. On the other side, there were the residents who were illegally blocking the road. According to the Guiyang police, both sides interrupted social order and caused huge economic losses. That was why the scene took place. Both sides were detained for criminal activities and held legally responsible. Recently, violent demolitions have often come to people's attention. Today's <Xinhua Daily Bulletin> carried an article about violent demolitions on its second page. The article said that some real estate developers are fearless in hiring unqualified demolition companies or gangsters to use threats, coercion, water stoppage, electricity stoppage and even illegal detention to tear down houses. These actions damage citizen rights, soil the government's image and create social instability. In the violent demolition incident in Guiyang, the real estate developer had legal grounds for demolition but illegally hired people to conduct violent demolition. It is a problem in front of the relevant departments on how to reasonably and safely carry out demolitions. Meanwhile the extreme actions by certain people whose homes are targeted for demolition also raise concern. On August 22, 2003, a middle-aged man in set himself on hire at the Dengfu Lan Demolition Office. He received 97% burns on his face and died that night. In April 2008, a homeowner in Quanzhou city (Fujian province) set himself on fire at home to protest against the enforced demolition of his home and died. In February this year, a female homeowner poured gasoline on herself and injured herself in Chifeng city, Inner Mongolia province. Last month, CCTV's <Economy 30 minutes> program reported on the female homeowner Pan Yong who wielded the <Property Rights Law> from her rooftop and tossed home-made firebombs at the bulldozers last June. Host: Professor Wang, we have just seen some of the more extreme actions by the demolishers and the demolished in that video. Let us turn our eyes back on the incident in Jinniu District. The demolisher said that they were acting in accordance with the law. Your house is an illegal building. Given this definition, what reason does the owner of the targeted building have? That is, when he is trying to defending his own rights. Wang: If this building is illegally constructed, it is a demolition and not a demolition/relocation. Because you built illegally, I will demolish it. But we see that the discussion is quickly extended to just when is a building illegal? In the tragic case of Tang Fuzhen, her house was declared to be an illegal construction. But I think that our first question must be that if this house is an illegal construction, then it was built illegally in 1996. Host: From 1996 to 2009. Wang: Yes, until August 2007. Wang: It was more than ten years' time. Where were all those government departments which are supposed to supervise this building? Shall we say that because you were negligent, inactive or irresponsible that caused things to become this way? That is the first problem. The second problem is even more interesting. From the official information from the Jinniu District, the urban plan was revised in August 2007. A waste management plant was planned with Tang Fuzhen's house within the zone. Please notice that the plan was developed in August 2007 and the law enforcement department showed up in October 2007 to say that this building is illegal and has to be demolished. In terms of timing, they wanted to demolish the building for planning purposes but they came around with the seemingly proper reason that it was illegally built. Host: What happened next? Of course, this was an illegal building from the very start. But before the government decided on the plan, it was legal. Once you changed your mind, it was illegal. What is the sense? Wang: This is a very common situation in many of the demolitions. Due to the new plan, the original building which used to be legal becomes illegal with respect to the plan. In a certain sense, the plan represents a new law. With respect to this new law, the building is illegal and must be demolished. For the sake of urban development, citizens may have to pay a price. But two points should be noted. Firstly, this type of demolition cannot be carried out by extreme violence. We have seen this in many demolitions, especially those carried by real estate developers. In the short video that we just saw, there was a clash in Guiyang. That was actually an illegal and violent demolition. Host: Professor Wang, citizens use the <Property Rights Law> to defend their rights and the real estate property developer uses the <Urban Demolition Management Regulations> to exercise his rights. Both sides have their reasons. What gives? Wang: With respect to this problem, we can see that the homeowner Pan Yong in Minheng district (Shanghai) tried to wield the <Property Rights Law> to defend her housing property. But the <Property Rights Law> may not be able to fend off the <Urban Demolition Management Regulations> sometimes. Wang: This is because the assumptions of the <Demolition Management Regulations> are very specific. In the regulations for urban housing management, it refers to the relationship between the government, the demolishers and the targets for demolition. In this sense, the demolisher is looking after his own interests whereas the government is looking after the public interests. Therefore the demolisher may not be looking after the public interests. He may be using all sorts of means to carry out the demotion for the sake of his own interests. Therefore, the <Property Rights Law> is weak and ineffective compared to the <Urban Demolition Management Regulations>. Host: The <Property Rights Law> should be the superior law whereas the <Demolition Regulations> turn them into subservient law when in fact they should be obeying the superior law.